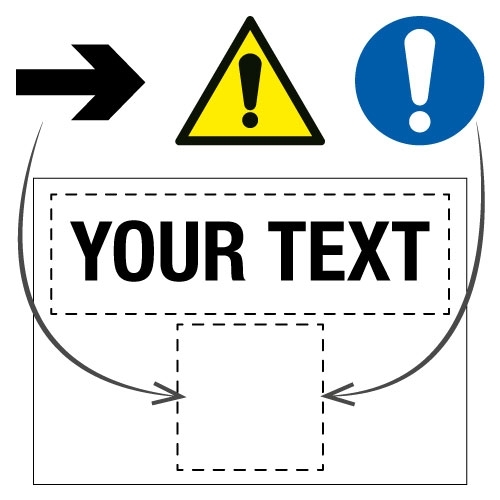 Create a customised information sign which includes your choice of text and symbols. All symbols are ISO 7010 compliant and we also offer a broad range of sizes and materials for your bespoke sign. A robust polypropylene material which is 1.2mm thick and compliant with fire retardant standards DIN 4102-Part 1. Fixings are available separately; we recommend using screws or adhesive to fix into position. A flexible material which is ideal to fit around curved surfaces. Features a simple peel off adhesive backing for quick application. A durable 1.2mm polypropylene plastic with extremely adhesive 3M backing for a strong bond even in harsh conditions.